The HarmonyBuilder (Institutional) package adds further networking capabilities to HarmonyBuilder (Professional), allowing students and teachers to interact with each other via a dedicated database. 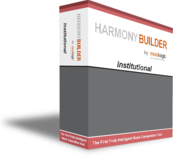 This means that assignments, homework and compositions can be easily shared with the intended recipients directly from the HarmonyBuilder (Institutional) interface. This makes life easier for teachers who can now post all their coursework in a dedicated online account, while students can access the account for coursework updates. Students are also provided with an online account, which they can use to store their coursework online.